The Delhi Municipal Corporation Recruitment 2018-2019 Notification is out. Applicants want to know more details about MCD Recruitment 2018 then check this article until the end and know latest updates about this article. The job seekers want to get job in Central Govt Sector, then apply for 195 Kitchen Staff, Mali, A Grade Staff Nurse, Ambulance Attendant, Catering Supervisor, Dental Hygienist, ECG Technician, Family Welfare Worker, Public Health Nurse, Laboratory Attendant, Lab Assistant SDMC, Operation Theater Assistant, Pharmacist, Refractionist, T. B Health Visitor, Dhobi, Physiotherapist, Statistical Clerk, Ward Boy, X-ray Assistant posts before 5th April 2018. Therefore, applicants can go down and gather complete details about www.mcdonline.gov.in MCD Delhi Recruitment 2018 Notification. Here, the officers of Municipal Corporation of Delhi (MCD) had issued Delhi Municipal Corporation Recruitment 2018-2019 Notification on 29th March 2018. Therefore, the Application Form submission had started on that day. Up to now, more application forms are received by the Municipal Corporation of Delhi (MCD). So We suggest remaining applicants hurry up and apply for these posts before the due date. Candidates want to know eligibility criteria details can check this article completely. Because of, we had provided complete details about Municipal Corporation Vacancy 2018 with a neat explanation. We had furnished all the details about Delhi Municipal Corporation Recruitment 2018-2019 Notification in the above table in a clear manner. Aspirants can check the table carefully and note down the details about 195 Ward Boy, Lab Assistant & Other Vacancies. The job seekers can submit your application form through Online Mode before the last date that is 5th April 2018. After the last date, the authorities of Municipal Corporation of Delhi (MCD) don’t accept the application form. Therefore, interested applicants can submit an application form for MCD Recruitment 2018 Delhi within the given time duration. Contenders don’t pay the application fee for the Delhi Municipal Corporation Recruitment 2018-2019 Notification of 195 Ward Boy, Lab Assistant & Other Vacancies. In the below section, we had provided complete details about Municipal Corporation Vacancy 2018 eligibility details such as Education Qualification, Pay Scale, Selection Process, Age Limit, etc. Therefore, applicants go through the complete article and gather all the details about www.mcdonline.gov.in MCD Delhi Recruitment 2018. However, there is no Application Fee. Therefore, applicants want to know more details about Registration Fee can check the official MCD Recruitment 2018 Notification once. Kitchen Staff, Mali, Dhobi: Applicants must qualify in Primary with minimum qualifying marks from a recognized University/ Board/ School or equivalent. A Grade Staff Nurse, Catering Supervisor, Dental Hygienist, ECG Technician, Family Welfare Worker, Lab Assistant, Operation Theater Assistant, Pharmacist, Refractionist, T.B. Health Visitor, X-ray Assistant: Contenders have Matric qualification from a recognized University/ Board/ School or equivalent. Ambulance Attendant, Laboratory Attendant, Ward Boy: Middle pass from a recognized University/Board/School or equivalent. Physiotherapist: Qualify for Diploma in Physiotherapy from a recognized Institution. Statistical Clerk: Complete Degree in Mathematics, Statistics/ Economics as one of the subjects from a recognized University or equivalent. The Age Limit is varied for Post Wise. Below, we had mentioned that vacancy wise Age Details. Aspirants can check this very carefully. The Age Limit For Kitchen Staff, Mali, A Grade Staff Nurse, Ambulance Attendant, Catering Supervisor, Dental Hygienist, ECG Technician, Family Welfare Worker, Laboratory Attendant, Lab Assistant SDMC, Operation Theater Assistant, Refractionist, T. B Health Visitor, Dhobi: 18 Years to 27 Years. Minimum and Maximum Age Limit For Public Health Nurse, Pharmacist: 18 Years to 30 Years. Age Limit For Physiotherapist: 18 Years to 32 Years. Can check the official notification to know about Category Wise Age Relaxation details. In this section, we had mentioned the Post Wise Pay Scale details in a clear manner. Aspirants who will select for Kitchen Staff, Mali, Ambulance Attendant, Catering Supervisor, Dental Hygienist, ECG Technician, Family Welfare Worker, Laboratory Attendant, Lab Assistant SDMC, Operation Theater Assistant, Pharmacist, Refractionist, Dhobi, Statistical Clerk, Ward Boy, X-ray Assistant Posts those applicants will take pay scale of Rs. 5200/- to Rs. 20,200/- along with Grade Pay Rs. 1300/-. Candidates open the official web portal of the Municipal Corporation of Delhi (MCD) @ mcdonline.gov.in. 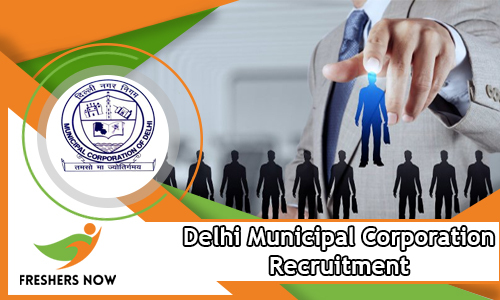 Search for the Delhi Municipal Corporation Recruitment 2018-2019 Notification on the home page. Click on the Notification link after seeing it. Read the Notification clearly and then press the Online Application Form. Fill the details mentioned on the Application Form and also attach the required documents, scanned photo, and signature. Applicants can also click on the below link to apply through this page for the Municipal Corporation Vacancy 2018 without any interruptions. Therefore, aspirants visit our blogger of Freshers Now to know more updates about Delhi Municipal Corporation Recruitment 2018-2019 Notification.